In this clinical case, Dan Lazar illustrates how the contoured shape of Unica assists with placement; resulting in a pleasing aesthetic result. Dr. Dan Lazar graduated Dental School in Cluj-Napoca in 2005, specialized in dental aesthetics and dental photography. He is the co-founder of the Romanian Dental Photography Association, and an instructor for Voco Gmb. 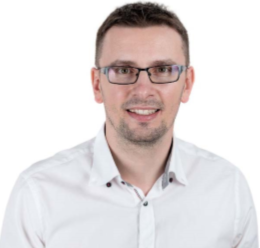 He is currently practicing in Oradea and Salonta - Romania and holding lectures on dental photography and dental aesthetics all over the country. All images are courtesy of Dr. Dan Lazar. The patient came to our attention for aesthetic rehabilitation; the analysis revealed an old damaged composite restoration that should be replaced on both incisors 11 and 21. The following case shows the step-by-step direct composite restoration using the Polydentia’s UNICA anterior matrix powered by Style Italiano. 1. Pre-operative view of incisors 11 and 21 showing the old composite restorations which should be replaced. 2. The quadrant under isolation. 4. Unica anterior matrices placed on both incisors 11 and 21. The doomed shape of the matrices embraces the teeth and help the practitioner to better see where the midline is placed. In this case, the stability of the matrices itself does not require wedges or myCustom Resin to stay in position. 5. Incisor 21 has been restored first; this image shows the proximal edges built up. 6. Incisor 21 after the removal of Unica. The contoured proximal walls of the matrix ensure an accurate proximal morphology with minimal or no contouring. 9. The clinical situation after the reconstruction of the two veneers and initial finishing and polishing. 10. Final finishing and polishing procedure, transition lines after the hidratation of the composite. This step is essential to obtain a visual appearance of the composite veneers that will please the patient. 13. For finishing the second morphology a hard rubber with low speed is used to smooth the surface. 16. Final outcome, side view. The booth veneers were made in two sessions, one session for reconstruction and primary finishing(1,5h) and the second appointment for final finishing and polishing (45 min). The contoured shape of the Unica anterior powered by Style Italiano allows the clinician to restore the natural proximal and cervical morphologies at the same time in a very predictable way, making the matrices a very useful product for anterior restorations.